We will help digest this information and break it down for you. "The elliptical trainer combines the motion of stair-stepping with cross-country skiing, providing a low-impact aerobic workout. Many elliptical trainers use alternating push/pull resistance bars to add an upperbody workout as you stride. The pedals can also be reversed (backward stride), which not only works the muscles in a slightly different manner but allows some variation in your workout." "There are two main types of elliptical machines available: rear-drive and frontdrive. " "A front-drive elliptical machine uses articulating pedals in order to match a natural stride of a rear-drive unit." Many of the better front driven units have biomechanically correct articulating pedals. Be wary of the cheaper units under $1000. You can now also find many front driven machines with incline as well. The main point here is that front driven machines with articulating pedals will match the feel of a rear driven machine, are just as comfortable and are equally recommended by the American College of Sports Medicine. So anyone who may tell you rear driven is better, is simply not telling you the truth. "The primary advantage of a front-drive unit is the cost; no matter how much of a bargain it seems, front-drive units without articulating pedals may result in motion that is unnatural and uncomfortable for most consumers. Make sure that stride length is comfortable! Some units accommodate a stride length of only 14 inches, which is too small for a tall person, while others are as long as 21 inches. A stride that is too short will make for an awkward, jerky elliptical ride." So both articulating front driven machines and rear driven machines are fine. Some may try to tell you to keep your heel flat on an elliptical. The fact is that you may have more of a natural running feel if your heels lifts up. When is the last time you moved flat footed? Do you do anything flat footed? This is a myth perpetuated by non-science. 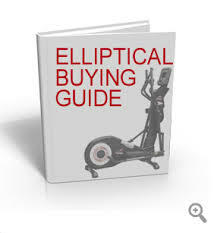 Just check out the picture below on The American College of Sports Medicine's brochure for selecting an elliptical. It is of a front driven recommended machine. "Ask lots of questions. Take a ten-minute test drive on several different machines. You will quickly develop a preference for console options, set-up and frame construction. Basic consoles should display time, distance, rate of speed and intensity level. Intensity may be controlled manually or pre-set from a menu of programmed workout choices when you start exercise. If your ten-minute test drive is even remotely uncomfortable, do not buy the machine." "Elliptical and stair climber machines range in price from a few hundred to a few thousand dollars. If you cannot afford a quality machine, your money may be better spent on a health club membership." "It is essential that your machine have solid construction and a stable frame, in order to give you a safe and effective workout. The handrails should be positioned so that your workout posture is upright with the knees behind the toes. Bending forward places a great amount of stress on the back and wrists. Using the handrails to support part of your body weight reduces the effectiveness of your workout and puts you at risk for injury. Handrails should be used for balance and/or resistance training. Read all of the manufacturers instructions to get the most out of your machine!" "Do you have appropriate floor support for the weight of the machine?" "What is the maximum weight allowance of the machine? Most will have a maximum user weight of 350 lbs." Is the space large enough? Is the ceiling height sufficient? Will the machine need to be stored periodically? Are there wheels that make the machine moveable?" and reputable? Is the machine durable, easily assembled and easily maintained? Look for a product that is maintenance free. A well-designed unit takes normal wear and tear into account. Does the machine come with a warranty? Are local technicians available for service? Look for a warranty that provides for a minimum of one year service and one to three years coverage on parts. Be sure your warranty includes electronics and other key components, such as the resistance/braking system." "Check the difficulty levels available on manual mode as well as the range of programs available. Are you able to increase the difficulty of your workout as you increase your fitness? Check the control panel features: Is it accessible and easy to read? Is it user-friendly? Does it offer the information important for your needs (time, distance, resistance, calories, etc.)? Is the noise level acceptable?" "When exercising, maintain the correct posture by keeping your shoulders back, head up, chin straight, abdominals tight, and arms relaxed. Your hands should rest lightly on the hand rails to assist with balance (or use the work-out bars if available). Do not lean forward or grip the bars tightly. Posture should be upright. If you have a tendency to lean on the hand rails on a stair stepper, adjust the step rate. Increasing the pedal resistance will cause you to slow the stepping rate. This should allow you to take your weight off the hand rails." Relax and maintain a steady stride, going through a comfortable range of motion. A good machine should allow you to move comfortably and smoothly, without the chance of your knees bumping into the console. Avoid machines with pedals that limit your range of motion. Any fitness machine is only as good for your health as the frequency with which you use it. ACSM recommends exercising for at least 150 minutes per week, consistent with the federal physical activity guidelines."